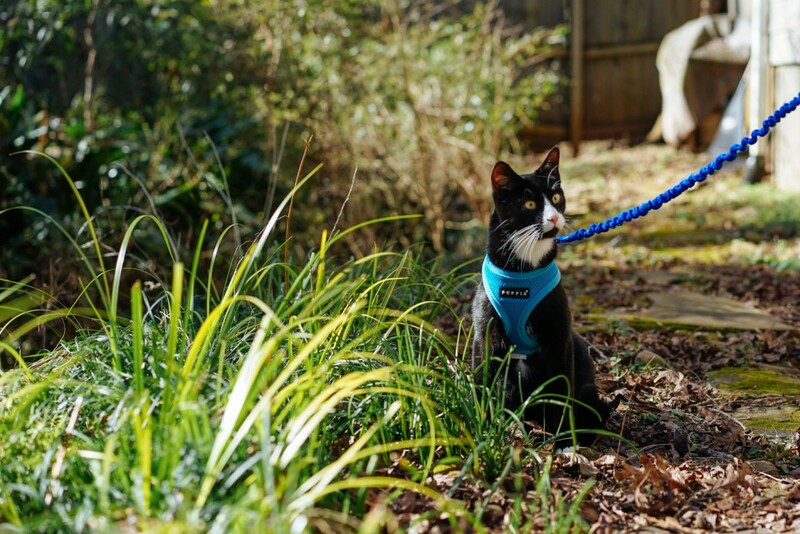 If you want your kitty to join you on outdoor adventures — even if it’s just in the backyard or on the porch — you first need to find him a harness that fits comfortably and teach him to walk on a leash. Leash walking won’t only come in handy when you’re outside, but also when you’re traveling or taking your cat to the vet. 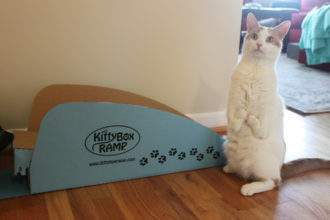 It’s also a great way for your kitty to get exercise, and it can alleviate boredom-related behavior problems. Plus, it can be fun for both of you, if your kitty enjoys it. 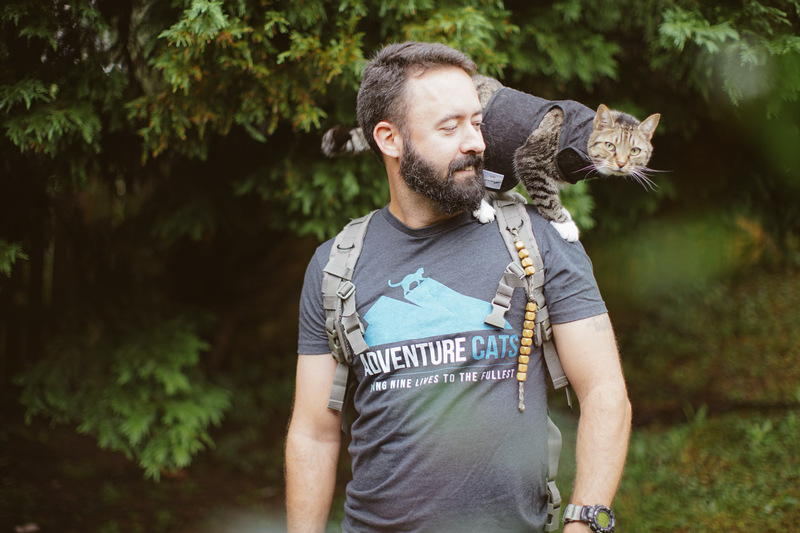 “Walking outside can be great fun for cats — it gives them new things to see and sniff out,” veterinarian Dr. Frank McMillan, director of animal well-being studies at Best Friends Animal Society, told Adventure Cats. “If the cat isn’t comfortable on walks, there are some great strollers (like the ones we use extensively at Best Friends) that allow cats to see and smell things they don’t get to in the house. 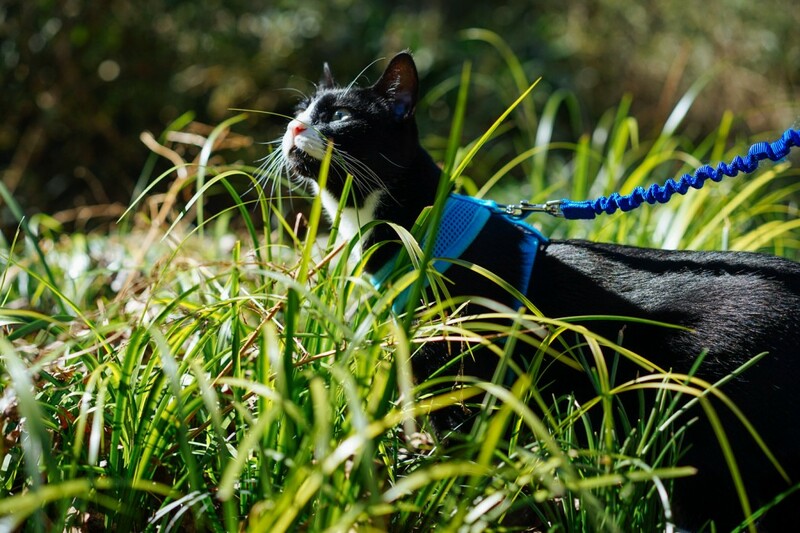 Most cats can be trained to walk on a leash, but certain feline personalities are more accepting of new experiences like donning a harness and walking outdoors. The best time to introduce your cat to a harness is as a kitten because he’ll be naturally more accepting of it; however, older cats can also learn to walk on a leash if you’re patient and make leash training a positive experience. 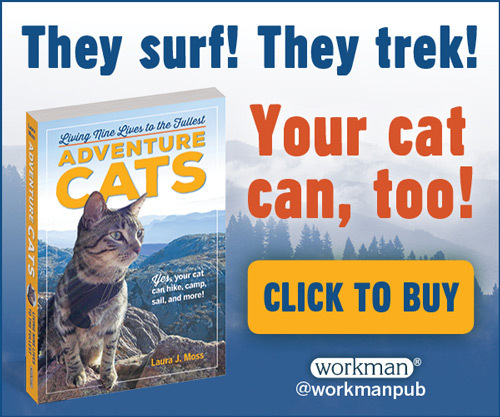 However, keep in mind that walking on a leash and venturing outdoors isn’t for every cat. 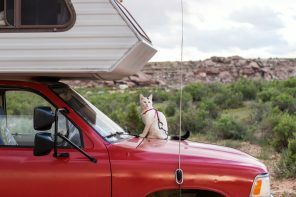 Some cats may never be comfortable on a leash or outdoors due to age, health or personality, and you should never force your pet outside of his comfort zone. You can still help your kitty stay happy, active and stimulated by having an indoor adventure! 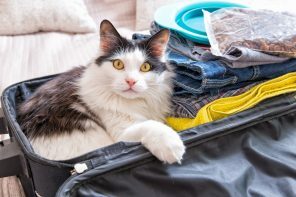 If you think your cat is a good candidate for leash training, read on for tips on how to begin leash training your cat indoors. The key to getting your cat used to a harness is making it a positive experience — and that means food. 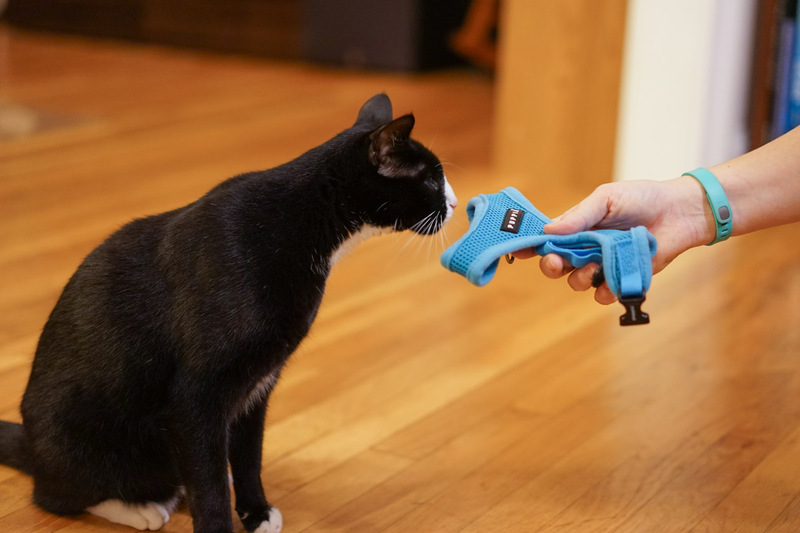 You can begin by leaving the harness by your cat’s food dish, or by simply holding out the harness so he can sniff it and then feeding him treats afterward. New noises can be alarming to some cats, so practice snapping the harness together or undoing the Velcro to get your kitty accustomed to the new sounds. Now that your cat is aware of the harness, slip it on him, but don’t fasten it. Provide more treats as a distraction and to help your cat associate the harness with a positive experience. If your cat is comfortable at this step, you can fasten the harness and practice adjusting the fit. You should be able to fit one or two fingers beneath the harness — but no more than that. Keep in mind that cats can back out of harness when they’re frightened, and you certainly don’t want your cat getting away from you outdoors. Leave the harness on for a few minutes, and then provide another food reward. Do this for several days, paying attention to how your kitty reacts to the harness. If he seems comfortable in it, leave it on a bit longer, but if he gets upset, provide a food distraction and slip the harness off. Try again later with a better treat — perhaps some yummy canned food or tuna — and remove the harness sooner this time before your cat reacts negatively. 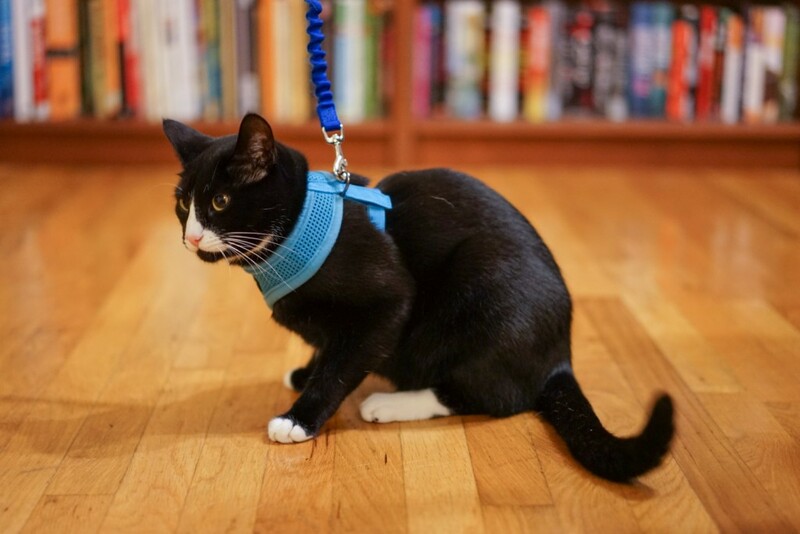 It’s completely normal for cats to freeze up, refuse to walk or walk very strangely the first few times they’re wearing a harness. Your cat has likely never experienced the sensation of something on his back before, so it’s going to take some time to adjust to it. Take your cat into a room where he’s not likely to snag his leash on furniture or anything else, and then attach the leash. 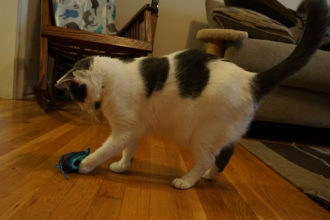 You may want to let the leash drag behind him as you feed him treats and engage him with toys, but a dragging leash can be alarming for some kitties. If this is the case, it’s best to hold the leash and let your cat wander freely. When your cat is comfortable with the feel of the leash, practice following him around your home, keeping the leash loose in your hand. Continue to provide plenty of treats and praise throughout this process. Once you’ve both had some practice with this, it’s time to try gently guiding your kitty. Apply a little pressure on the leash and call your cat to you. When he does, reward him with a treat. If you’ve done some clicker training, you can also use a clicker to reinforce that he’s performed a desired behavior. “You want to make sure he does not freak out when he feels pressure on the leash holding him back and that he doesn’t wriggle his way out, leaving you holding a leash and empty harness as he dashes off. Again, do this several days in a row,” Miller said. Learn more about leash training — including how to teach your cat to heel — from certified animal trainer Mikkel Becker in the video below. If the most your cat has interacted with the outdoors has been through the window, it’s likely he’s going to be on high alert when you take him outside for the first time so take things slowly. 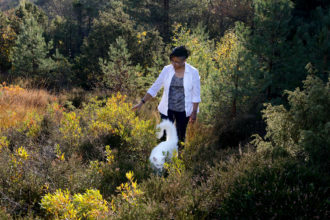 Keep in mind that you don’t have to take your kitty far from home to help him get used to nature. You can start in your backyard — and if it’s fenced in, that’s even better. First, pick up your harnessed kitty and carry him outside to a quiet area. Don’t let your cat walk out on the door on a leash or she may get used to doing so when she’s not leashed. Stay beside him and let him decide when he’s ready to do a little exploring. Keep the leash loose and follow behind your cat, but don’t force him to venture farther than he’s ready. Keep in mind that walking a cat is different from walking a dog. While your cat may happily accompany you on long walks, it’s more likely that he may prefer to simply sniff around your yard and doze in the sun. Regardless, it’s important to pay attention to what your cat is comfortable doing; don’t force him outside his comfort zone. Just like at home, your kitty is the one who’s calling the shots. Don’t let your leashed cat walk out the door on his own. Carry him outside every time. Don’t put the harness on your cat when he’s pestering you for a walk. “Don’t take your cat out when he is crying to go outside. Otherwise you’ll be rewarding the crying behavior and you will be hearing a lot more of that in the future,” Miller said. Never leave your cat outside unattended. Don’t tie your cat’s leash to something and leave him — not even if you plan to walk away for only a minute. Your kitty could become tangled in the leash and injure himself, and he won’t be able to escape from any approaching wildlife. In the video below, watch how cat behaviorist Jackson Galaxy helped New York Times writer Stephanie Clifford teach her cat, Mac, to walk on a leash. For more information on leash training a cat, visit the ASPCA. I’m so happy I found this website! I have been waning to take my 18 year old cat on hikes with me as I no longer trust him to run free outside on his own. Awesome website! 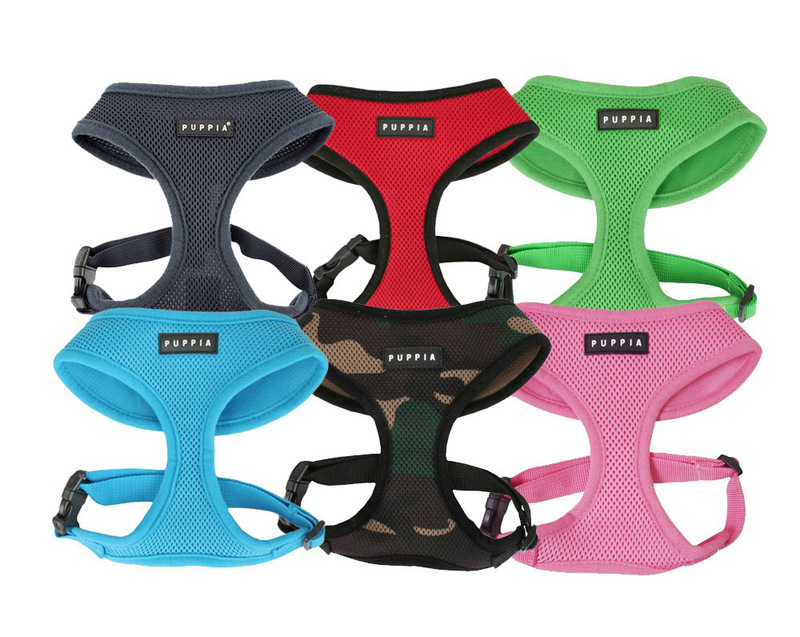 Have you tried the Puppia harness B on cats? 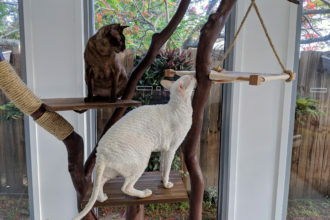 Is the A or the B model better for cats? Or does it not matter. With the S – you have to get his head through. With the B model, you have to get his paws through the holes. This is great cat walking advice, I have been successfully cat walking for some time. Now walking two cats on leashes at the same time, try this link for video: https://youtu.be/_3xTULGJhRE. Great website. Do you have any ideas how i can help my British short hair get used to cars? We have been walking her in the garden which she now seems to love, however the street seems to be out of the question as there is so much noise. She dives into bushes when cars go past and just freezes up when there are other types of noises. I am so glad that I found this site as well. I adopted a 5 year old cat Nov 14/15; she really wants to go outside. Her previous owner had her declawed (unfortunately), so she cannot be left to go out on her own; although I wouldn’t let her anyway. I would love to bring her for a walk and I think she would just love it. 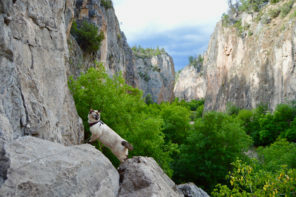 She is fearless and very adventurous. Thank you for your wisdom!! Does anyone have any advice on getting a cat to actually walk with you? My kitten is 4 months old, we got her started early, and we’ve been outside many times, but when I let her down to walk on her own she will not walk along side me, she just goes around sniffing bushes and such. She will not stay on my backpack for too long either, because she wants to go down and explore. So fun. Wish I had read something like this 18 years ago. I think KC would have been a great adventurer with me! Before she passed away in May, I’d take her out to the back yard and let her explore. That always tired her out and she’d have a good long afternoon nap afterwards! I’ve been putting the harness on my cat before her dinner to associate the harness with something positive, but I’m finding that it’s negatively affecting her eating habits. She ends up isolating herself when she has the harness on and avoids eating. Has anyone had experience with this? Try getting some special treats for harness training instead. Let her eat dinner normal. But when you do harness time reward her with a treat when you put it on. Can anyone tell me what the brand name of the harness is in the video? I like the wide girth and neck. Here is the link for the one this site sells. I assume that’s the one in the video. My cat is very timid because she lacked contact in her former home is there any good way to make her more sociable i would love to begin training her on leash, also are there any recommended harnesses. I’m glad this was available for everyone to have access to. I am a college student and I’m in the process to get my cat as an emotional support animal and my school informed me she has to be leashed trained. This gave me the steps I would need to have her comfortable with it. Thankyou so much! hey adventure cats I have a wonderful adventure kitty who recently has really taken to leash training and loves every walk but it seems when she wears out she doesn’t want to walk or be carried how do I convince her when she’s tired that carrying her is cool she loves being carried any other time but I can’t seem to convince her that when she’s tired being carried is okay while on the leash. What type of harness did you use? My car is great in the yard, but is super afraid of being in the car. Any tips to conditioning him to feel more comfortable being driven to the vets? I’d like to take him on his lead instead of the crate ( he weights 16 lbs) this is also his exercise. This is gold! Can you tell me which leash is best for cats? Flexi, normal or stretchy? And where is that stretchy one in the photos from?